288 pages | 119 B/W Illus. individuals who want to have a knowledge of the below-mentioned topics. 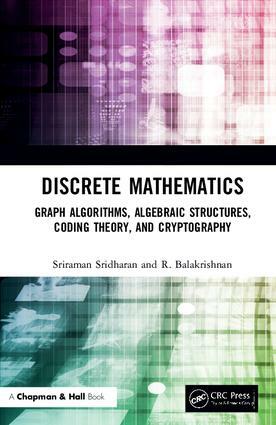 Provides a complete discussion on several graph algorithms such as Prims algorithm and Kruskals algorithm for sending a minimum cost spanning tree in a weighted graph, Dijkstras single source shortest path algorithm, Floyds algorithm, Warshalls algorithm, Kuhn-Munkres Algorithm. In addition to DFS and BFS search, several applications of DFS and BFS are also discussed. Presents a good introduction to the basic algebraic structures, namely, matrices, groups, rings, fields including finite fields as also a discussion on vector spaces and linear equations and their solutions. Provides an introduction to linear codes including cyclic codes. positive integer is prime or not in polynomial time is presented- the first time in a textbook. Illustrative examples have been presented throughout the book to make the readers appreciate the concepts described. Answers to all even-numbered exercises in all the chapters are given. Introduction to Graph Algorithms. Algebraic Structures. Coding Theory. Cryptography.